All Men Become Sisters, an exhibition in 2016 at Muzeum Sztuki in Łódź, now has a catalog that is both an overview of the exhibition and an extension of the core concepts of “feminist perspectives on work, production, and reproduction” with the inclusion of additional essays. The film Nightcleaners (1975), by the Berwick Street Film Collective, was featured in the exhibition and in the publication. The publication can be purchased at Sternberg Press. Every Picture Tells a Story will screen at the Museum of Orange Heritage, Sloan’s House, Loughgall as part of the discussion of the art William Scott. The event is free to all and the accompanying discussion will be led by Cardwell Mcclure, William Scott’s nephew. The exhibition Hockney / Hamilton Expanded Graphics opened successfully in January at the Museum Ludwig and has been gaining notice in the press . The exhibition contains two films by James Scott, Love’s Presentation and Richard Hamilton and additional audio recordings by Scott of David Hockney reading selected poems by C.P. Cavafy which are shown in conjunction with Hockney’s portfolio of prints Illustrations for Fourteen Poems by CP Cavafy. The exhibition will run through April 14, 2019. Nightcleaners and ’36 to '77 Box Set available! The box set of Nightcleaners and ’36 to ’77 is now available online through several distributors. Direct link not available, please search for Nightcleaners on König main search. For US and other locations, orders may be placed through Amazon (DVD Version) but fulfillment is slow. You may also order from Walther König and LUX with increased shipping for quicker arrival. To mark the first digital release of Nightcleaners (1975) and its companion film ’36 to ’77 (1978) a special box set has been produced containing the two films on disc, facsimiles of historical material, including newsheets of the women’s movement, four commissioned texts (by Sheila Rowbotham, Dan Kidner, Kodwo Eshun and Suhdev Sandhu), rare images, and contributions from the filmmakers. This publication is a collaborative effort of Raven Row, LUX, and Walther König. Article in the current edition of Monopol Magazine. The Museum Ludwig will feature Scott’s films Love’s Presentation (1966) and Richard Hamilton (1969) in their upcoming exhibition, Hockney / Hamilton Expanded Graphics which runs from January 19 - April 14, 2019. The two films will be presented as installations within the exhibition. Additional audio of David Hockney reading selected poems by C.P. Cavafy, which were recorded by Scott during the process of filming Love’s Presentation, will be paired with David Hockney’s portfolio of prints Illustrations for Fourteen Poems by CP Cavafy for the first time. The Museum Ludwig will also be presenting both Love’s Presentation and Richard Hamilton theatrically on February 5th. The following evening they will also present Nightcleaners (1974) by the Berwick Street Collective (Marc Karlin , Mary Kelly, James Scott and Humphry Trevelyan ). James Scott will be in attendance for both screenings. I am pleased to announce the book and DVD launch of Nightcleaners and ’36 to ’77 at Raven Row on Saturday, November 17th. I, James Scott, will be in attendance along with other members of the Berwick Street Film Collective and current activists. Currently, this will be available for order through Amazon and Walther König. 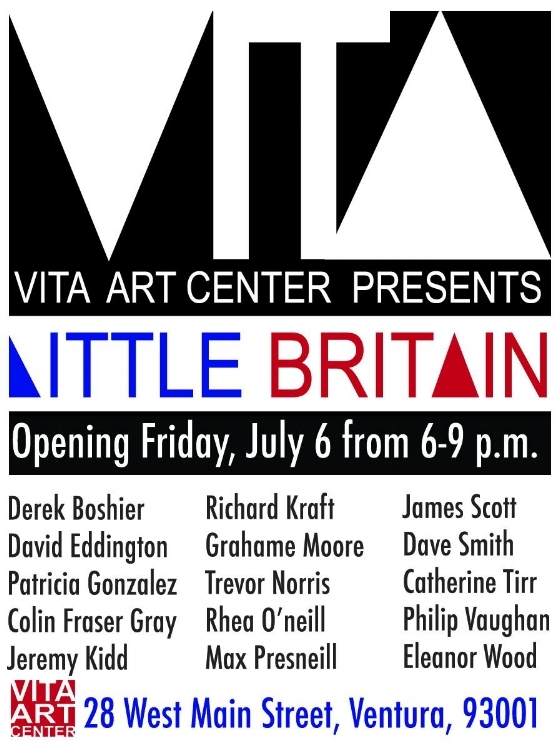 We are happy to announce the upcoming exhibition Little Britain which opens on July 6th, 6 - 9 p.m. The group exhibition features 15 artists from Britain now residing in the larger Los Angeles area, and includes two paintings by James Scott. As the exhibition continues, there will be a screening of Scott's films on Sunday July 22nd, from 4-6 pm. James Scott will be present for the screening and discussion. We are pleased to announce an exciting upcoming event at the BFI Southbank Theatre in London. This unique screening celebrates the newly remastered version of the film '36 to '77, a portrait of Myrtle Wardally, a cleaner involved in the Nightcleaners’ strike in the summer of 1973, as she reflects on her life before the strike and the impact that it made on her after. The screening is in anticipation of the fall DVD and Blu-ray launch by Raven Row and the publication of a new book of essays and source documents covering the two films. Produced by the Berwick Street Film Collective (a collaboration of Marc Karlin, John Sanders, James Scott, Humphry Trevelyan), the title ‘36 to '77 reflects the year of birth of Myrtle Wardally, and the year in which the portrait was made. James Scott together with Humphry Trevelyan and Jon Sanders will be present at the screening on July 5th with moderator Laura Mulvey. James Scott's painting Day and Night included in Dépayser at the Alliance Française de Pasadena. "As part of the International Month of the Francophonie, the Alliance Française de Pasadena is pleased to present Dépayser, a group exhibition featureing 17 artists who interpreted the French word "Dépayser" through drawing, painting, sculpture, photography and mixed media." To read the compete exhibition statement, click here. JULEE CRUISE featured on Velvet Blue EP out now! featured as cover art for Velvet Blue's new EP! Buy the CD here ! GREAT SCOTT: Review in Sight & Sound! James Scott; UK 1966-84; BFI Region 0 DVD; Certificate 15; 263 minutes; 137:1. Features: audio interviews with the director; booklet with production documents and essays by William Fowler, John Wyver, James Scott and Richard White. In his 1992 essay ‘L’éternel retour’, Peter Wollen wrote that there was no British equivalent of the nouvelle vague in the late 1950s and 1960s; the British Pop artists and critics who were fascinated by American mass culture never put their fascination on screen, so that “Godard’s films were the best possible substitutes for their missing English counterparts”. Fragments of that missing New Wave remain, however, and James Scott’s films about the leading Pop artists David Hockey, R.B. 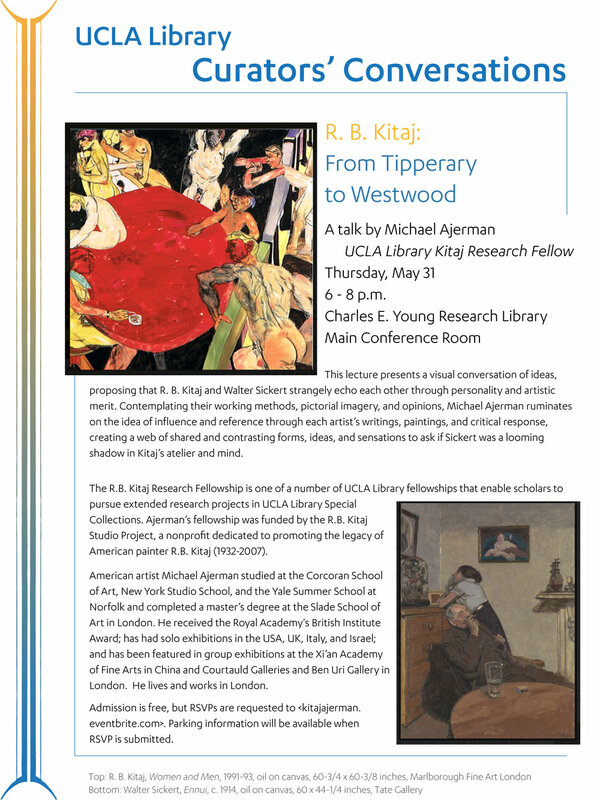 Kitaj, and Richard Hamilton are shining examples. Far from being straightforward documentaries, they were made in collaboration with the artists and amount to artworks in their own right; Scott had been a student at the Slade during Pop art’s heyday. Love’s Presentation (1966) follows Hockney as he prepares illustrations for a book of love poems by C.P. Cavafy, a major influence. Still in his twenties, Hockney was a Swinging London celebrity, recently included in David Bailey’s Box of Pin-Ups alongside Jean Shrimpton and Michael Caine. To get away from these associations, Scott’s film, which Hockney narrates, focuses on the craft of etching and aquatinting, which he performs in his Notting Hill flat, washing off the acid in the shower and poisoning himself with the fumes. At the end of the film, Hockney reads one of the poems over the finished images, which culminate in two men sharing a bed, contentedly looking out at the reader – a passage which the film’s distributor, the British Council, censored. By contrast, R.B. Kitaj (1967) forgoes craft for ideas, expounding in an interview, with confusing results, through one of Kitaj’s images, a modified page for a 1930s issue of Life magazine featuring potted biographies of the modernist masters – Matisse, Picasso, Mondrian – stands out as both a prime instant of early postmodernism and a neatly self-reflexive moment. Richard Hamilton (1969) is a masterpiece, simultaneously distilling, embodying and analyzing the Pop aesthetic of which Hamilton was a major progenitor. Reyner Banham defined Pop art as “unique works of hand-made fine art deriving their iconography and composition from mass-produced pop products such as cornflakes packs and US cars”; Scott’s film juxtaposes the two, intercutting Hamilton’s hand-made images with the adverts, pin-ups, and skylines that inspired it. In one sequence Scott breaks down a scene from Douglas Sirk;s noir Shockproof (1949) – a source for Hamilton’s Interor I and Interior II (1964) – to illustrate how for the European Pop artists much of the meaning of Hollywood films lay in the décor, not the plot. It was filmed in 1967, not coincidentally the year Godard abandoned commercial cinema, just as Pop was at the point of exhaustion. The main feature, Every Picture Tells a Story (1984), made for Channel 4, is a collaboration with an artist of an altogether more intimate kind: his father, the painter William Scott. Largely a conventional biopic, with occasional flash-cuts to his future works and brief clips from interviews functioning as a voiceover, the film is an unusually sensitive portrait of the elder Scott’s childhood and adolescence in Scotland and Northern Ireland, particularly affecting in its depiction of William’s relationship with his own father, a sign-painter whose encouragement of his son stems in part from his frustration with his circumstances – a frustration more than shared by the boy’s mother. The business of sign-painting provides a surprising echo (or foreshadowing) of the Pop films, but in general Every Picture Tells a Story evokes a less image-saturated time and place. Whereas Kitaj could discover modernists in a mass-circulation magazine, William Scott owed his exposure to what were revolutionary pictures and ideas to the happenstance that a young RCA graduate, Kathleen Bridle (played by Natasha Richardson, making her debut), was living in Enniskillen and gave him lessons. At the films end, as his younger self arrives in the London of 1931, “the most important spot in the whole world”, the septuagenarian Scott recalls that even the Royal Academy of Arts was “untouched” by modernism “and all the other isms”. It is a great loss to British cinema that this first entry in a planned trilogy did not have the sequels it deserved. 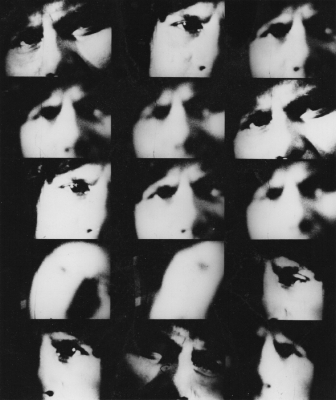 The titles comes from a conversation with Kathleen – “They are painted to be looked at, not talked about,” a proposition that Scott’s art films have all tested. Chance, History, Art... (1980) and The Great Ice Cream Robbery (1971), a double-screen film (one screen on each DVD) made with and about Claes Oldenberg, rather confirm it; but the extras relating to the latter open on to another side of Scott’s very varied career, revealing that during post-production he was already working with the Berwick Street Collective on The Nightcleaners (1975), described by Claire Johnston as “the most important political film ever to have been made in this country”. It would make a fine follow-up to this exemplary package. See the original PDF here ! Buy the DVD here ! 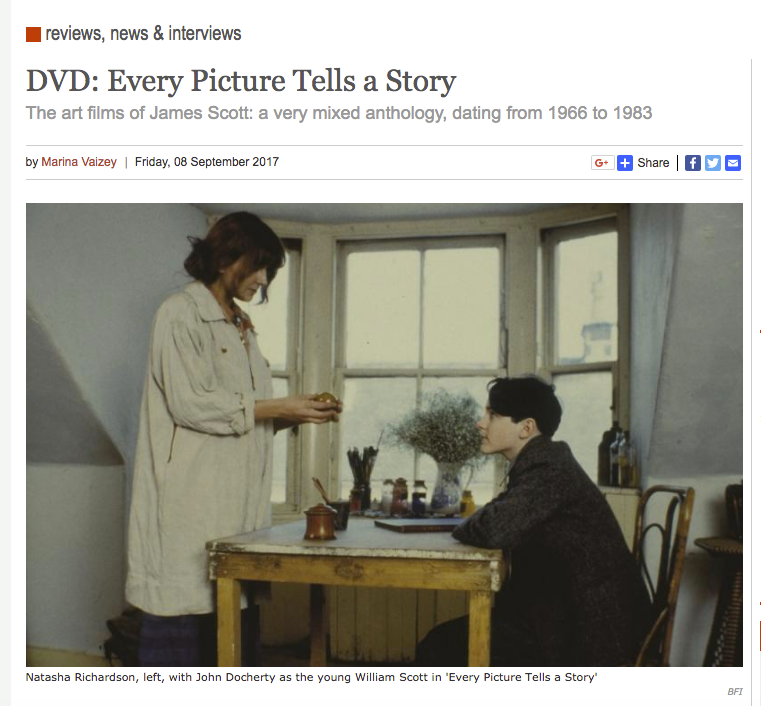 James Scott presents Every Picture Tells a Story (1984) and Richard Hamilton (1969) in conjunction with the BFI release of a new Blu-Ray/DVD collection of Scott's work. The multi-disc survey contains new HD digital scans of Scott's feature-length film, Every Picture Tells a Story, as well as his films on artists (1966-1980). For more information and to purchase tickets: click here ! To pre-order the DVD collection at a reduced price: click here ! Every Picture Tells a Story DVDs NOW AVAILABLE for PRE-ORDER ! We are pleased to announce the new Blu-Ray/DVD release of Every Picture Tells a Story (1984), along with the complete set of James' films on artists: Love's Presentation 1966 (David Hockney), R.B. Kitaj 1967, Richard Hamilton 1969, The Great Ice Cream Robbery 1970 (Claes Oldenburg and Hannah Wilke), and Chance, History, Art... 1980 (a look back at surrealism through contemporary artists). Copies of the DVD will be available for purchase at the celebratory BFI screening (August 16th), and the official public release date of the set will be August 28, 2017. We are pleased to announce an exciting upcoming screening at the BFI Southbank Theater in London. On August 16th, the BFI will host a screening of Every Picture Tells a Story and Richard Hamilton, followed by a Q&A with James Scott. The screening celebrates a new release of Every Picture Tells a Story on Blu-Ray/DVD. 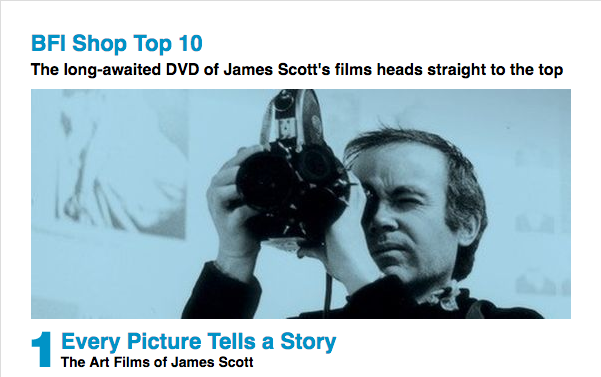 The Blu-Ray/DVD will also included a newly remastered series of James' films on artists. In January and February 2017, James traveled to attend and give talks at three screenings. The first took place at the Lancaster Museum of Art in Lancaster, California. James introduced his film, Love's Presentation, and participated in a Q&A after the film. In February, James travelled to Kunstmuseum Woldsburf in Wolfsburg, Germany to present his film Richard Hamilton. You can watch his introduction and Q&A with curator Daniel Kothenshulte in the video below. James' last stop was at Eton College, where he presented his film Every Picture Tells A Story, which was screened in conjunction with an exhibition of William Scott's work.